Discussion in 'iPad General Discussions' started by Destroyer, Jul 5, 2011. Any one with cool ideas??? Apple tv is just great. Works with all iOS devices, can feed from iTunes and some services on the Internet. I am looking to get my first ever tablet. I plan on using it primarily for school to have something small to take with me to class and use as a mobile internet device for on campus that is larger than an iPod. I have looked up many reviews of both products and watched many comparison videos and they all say that if this is my first tablet, I should go for the new iPad. But I just don't see why having a better screen and cameras (which I will not use) would be worth an extra $100. The processor in the iPad 2 is the dual core which I am sure would handle my note taking and internet browsing fine. I just want a third party opinion on what I should get. I plan on buying one next week. And, in the future, please do not interrupt another conversation to ask your question. Not only is it against forum rules (it's called "thread hijacking"), it's poor forum etiquette. If you have a question that is unrelated to the topic of the thread you are in, please create another thread to ask your question. Thanks. Sorry for the interruption, Destroyer. I use my Sony entertainment system with the iPad working from the iPod dock and AppleTV through the optical connection. 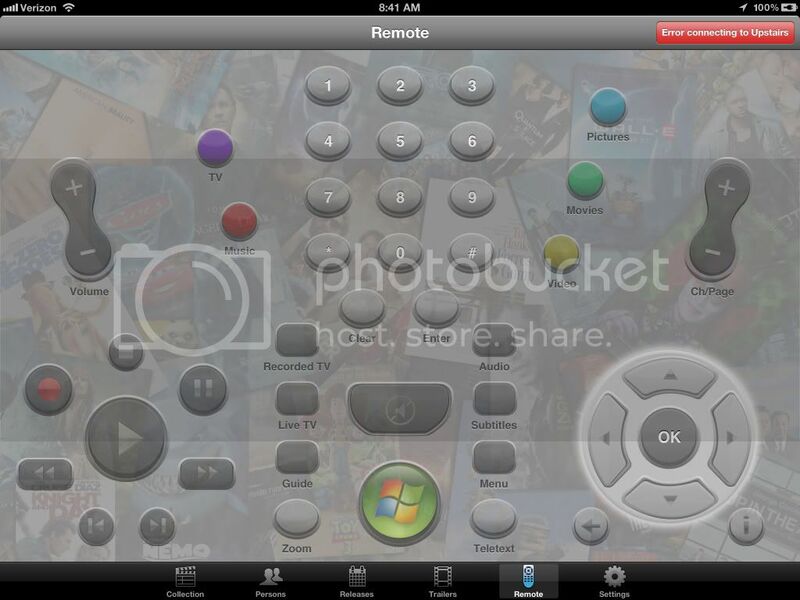 I have some remote contol apps like Roku and Boxee Box but I really do not like using my ipad as a remote contol. It is too clunky. It is the same reason why I don't use a computer and keyboard for playback of local files. If I didn't already own harmony remotes I guess I could see doing it from a phone to save the money. To the OP: I have been playing around with the third gen Apple TV. It does great for pictures and music. There can be a lag on mirroring that can get substantial at times. I haven't done a lot with video but I have seen some audio sync issues. I think if you want it perfect you need a cord which, for me, defeats he purpose. You can also push music, pictures, and some video to Boxee Box which offers a lot more than ATV but has some drawbacks because they have still yet to work out all the bugs. I use it daily but there are some things that drive me crazy. One other thing. I noticed hat LG has an app to control their new home entertainment system. You may want to some manufacurer searches and see if any of your equipment has an app or if you are in the market try to buy new equipment with apps available. I have 31TB of ripped movies on my upstairs server. This is not my entire collection, but it does include all of my blu-rays and some of my favorite DVDs. These are ripped to ISO, MKV, or folders depending on the origin of the content and whether it is a tV series or not (I like TV episodes in MKV format). I use MyMovies as the database. This works with Windows Media Center to ensure that I have cover art and metadata for each movie in my collection and presents a nice interface inside Windows Media Center. I have two home theater PCs, one upsides and one downstairs. 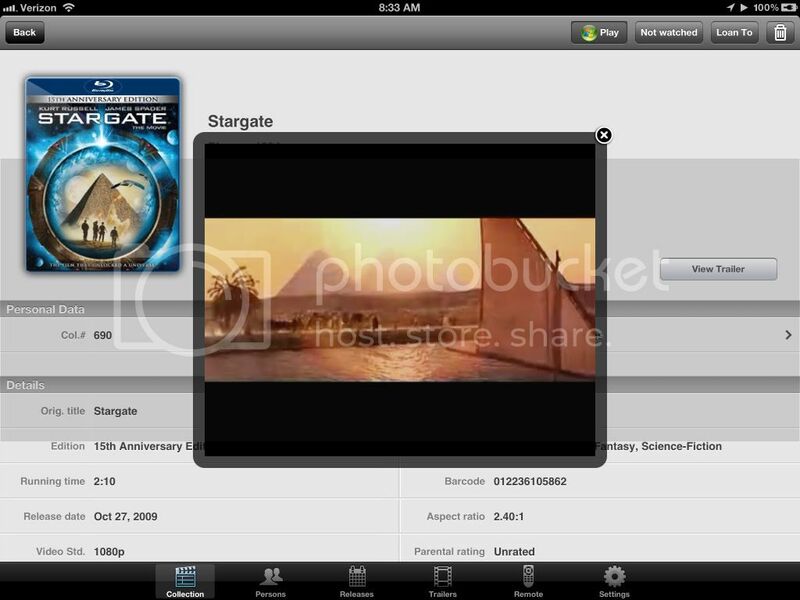 Both use the MyMovies software to keep the database which provides the back end to Windows Media Center. Both HTPCs can get to the movie server upstairs via my gigabit network, so I can play any of my movies from these PCs. These PCs send an video/audio signal over HDMI to an AV receiver I have at each location. These are the center of my home theaters and they both have at least 5.1 speaker systems and a HDTV for viewing. 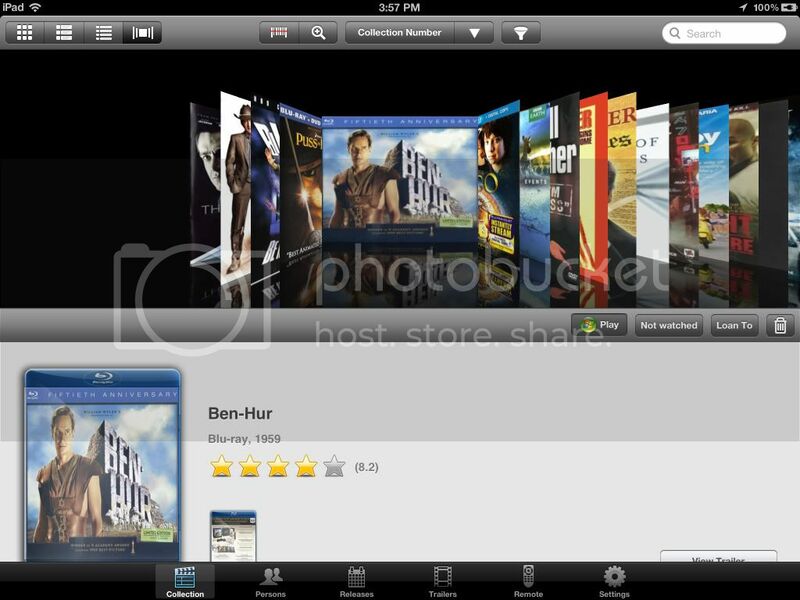 The MyMovies folks have apps that work on both iPhone & iPad, as well as Android devices. So, with these apps, I can control my systems inside Windows Media Center. That means I can call up a movie to watch with the app, and then play it. I can read all kind of info about the movie as well as view trailers and such. I can control playback on my HTPC from within the app, as it has a remote control feature. It works over your wifi network. All in all, pretty cool. I think this is on-topic with the question asked by the OP, though, obviously not everyone is going to have 31GB of storage on a PC sitting around. ONce the prices of HDDs start dropping again, I will start expanding my TB (I actually have even more TBs sitting in here that are not in use yet -- just holding for hard times like now). The error is because my HTPC is in sleep mode now and I'm not using Media Center. It goes away when I'm actually using the HTPC. There is also a TIVO app for iPad and iPhone. Works well if you have TIVO.